The Zira U shaped desk is a commercial-grade contemporary laminate desk with extensive options to personalize your workspace. 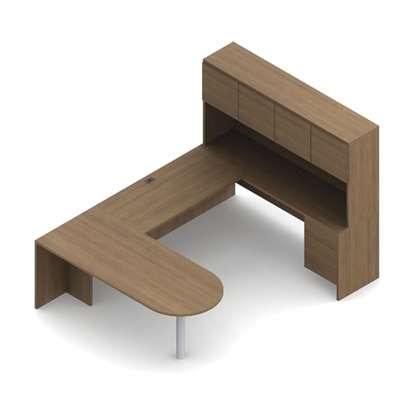 This beautiful eco friendly desk by Global is designed to meet your work surface needs. Free shipping and warranty available on all discount office furniture. 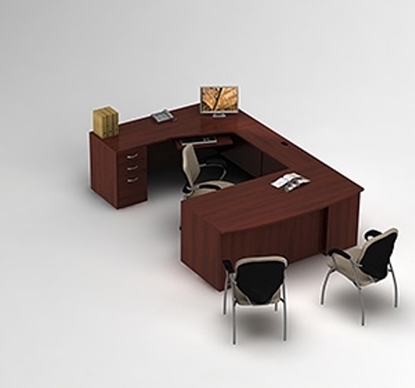 A contemporary desk with plenty of storage and a D-Island front to give your office an spacious feeling. 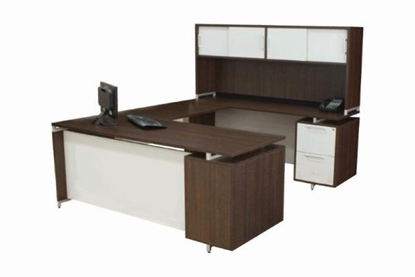 This office desk features a hutch and pedestal for storage and durable laminate construction. Genoa is a modular furniture collection, different sizes and configurations are available. Order today and get free shipping! This Ventnor series U shaped desk with hutch and drawers emphasizes sophisticated styling with the beauty of genuine wood veneer at an affordable price. Fits well in an executive office or home. Eco friendly and GreenGuard® certified. 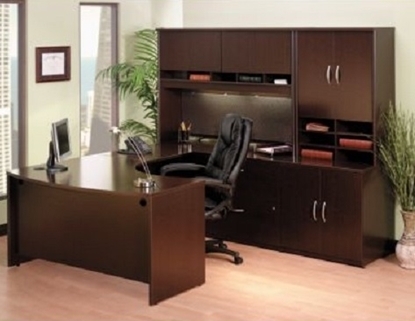 All discount office furniture comes with free shipping and warranty. A great addition to any home office or commercial work place. 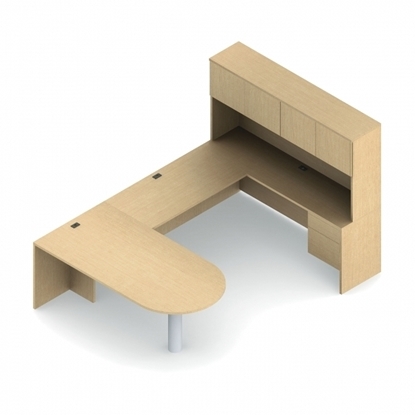 This U-Shaped desk is designed to have a residential feel to it. 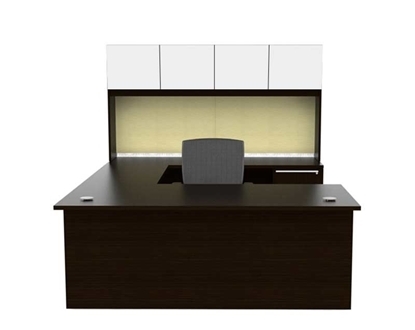 It features a 1 5/8" thick work surface, two pedestals for all your storage needs, and is available in 4 colors to match any existing office design. 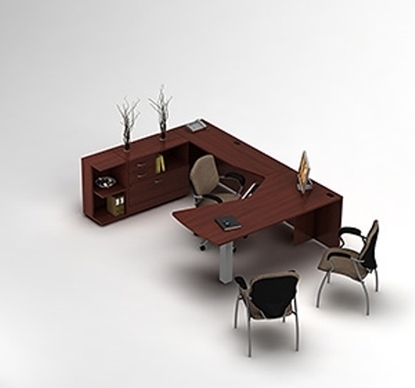 The Zira by Global U shaped desk with bow front is a commercial-grade contemporary laminate desk with extensive options to personalize your workspace. This eco friendly desk features a bow front to maximize your worksurface needs. Most components ship fully assembled. Premium full extension progressive ball bearing slides on file drawers. Free shipping and warranty available on all office furniture. 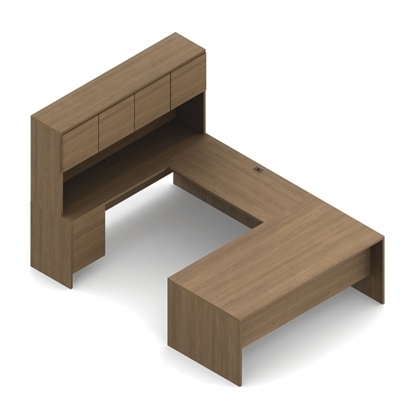 An elegant desk that would be a great choice for any home office or private office. This desk features a durable 1 5/8" thick top, chrome drawer pulls and standoffs, and is designed so the desk surface appears to float above its supports. A great combination of work surface and storage makes this U shaped desk a great choice for any office. This desk features two storage pedestals, a hutch with doors, thermally fused laminate construction, and is available in a wide variety of colors. Order today and get free shipping on all discount furniture. 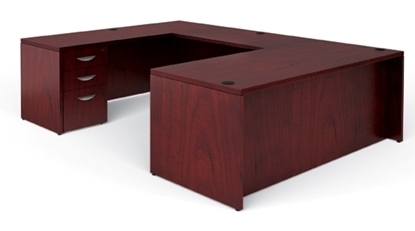 This Bush U shaped office desk with hutch features ample storage, a durable PVC edge, and wire management data ports. Included in the Series C executive package is a storage cabinet with an additional hutch on top. This unit is perfect for the executive who needs extra space. Order today and get free shipping on all furniture! A laminate U-Shaped Desk with hutch that combines Italian-influenced designs, style, and durability with functionality. This U-Shaped Desk features a floating work surface with a beveled edge and silver accent features. A desk with plenty of storage space, this U shaped desk works great in the home or commercial office. This desk features a hutch with open storage, two pedestals, and is available in a wide variety of colors via special order. (Stocked in Avant Honey) Order today and get free shipping! 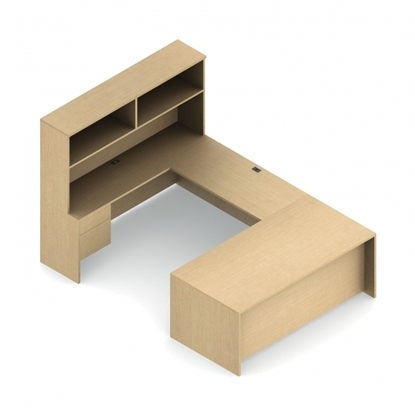 Get plenty of work space and plenty of storage space with this U shaped desk with hutch. This desk features 1" laminate construction, a hutch with doors, and is available in a wide variety of colors. Order now and get free shipping! For a sleek, stylish office, choose the Regency OneDesk U Shaped Desk with the floating desktop design and white drawer accents. Plenty of desk surface area and filing capacity for your office. Free shipping and warranty available on all Regency furniture collections. Verde is an office desk series featuring a multitude of architectural details. This U shaped desk with hutch features WoodTouch, a laminate with a textured surface that adds the look and feel of real bamboo. This desk is also eco friendly and GreenGuard® certified. Free shipping and warranty available. A great combination of work surface area and storage, this U shaped desk from Global gives you the best of both worlds. This desk features a durable 1.5" thick work surface, an open hutch for additional storage, and includes two hanging pedestals (box/file each). Get free shipping when you order now! An office package that provides plenty of storage without taking up work space by utilizing a wall mounted hutch. This desk features a 1 5/8" work surface with knife edge detail, two storage pedestals, and a wall mounted hutch that includes mounting brackets. This Mayline Aberdeen laminate U shaped executive desk combines fashionable aesthetics and unparalleled quality at an affordable price. Includes a 1 5/8" work surface, glass doors and distinctive fluted edge. Perfect for business or home office use. Warranty and free shipping available on all office furniture. With its distinctive edge detail, storage, and generous workspace, this Aberdeen U shaped desk with hutch combines good aesthetics with function. It offers a durable laminate finish. and works well in a commercial office or home office setting. An acrylic modesty panel, acrylic doors that slide effortlessly in aluminum door tracks, and a 1 5/8" thick work surface with a knife profile edge are just some of the features of this U-Shaped Desk. 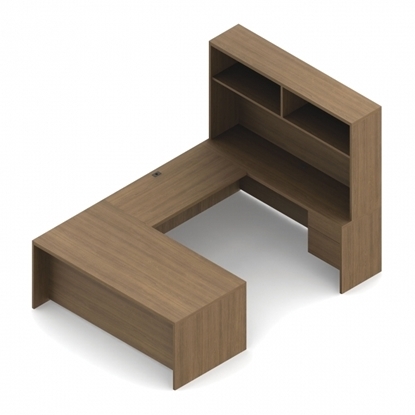 This U-Shaped desk is available in 3 unique colors and is handed and must be ordered in the proper configuration.